Last time I got cozy with my Mexican host family and received some amazing kindness in San Miguel de Allende (plus picked up a nasty cough). This time I leave the shelter of the Expat City and get back on the road. Nativity scene at the Tula parish church. I adore that it’s a hangar made of old tarps. Photo by André. My departure from San Miguel de Allende began with cobble streets so steep I had to get off and walk the bike. I had become settled in San Miguel, with its many cafes and conveniences, and yet unsettled at the same time. I didn’t feel at home with the colonization vibe of my fellow Anglo-Americans—or how they reflected on me. And yet I knew there was a good chance I’d be back; renting a room from Fay for a month or two sounds appealing, and the Spanish language school was just that good. Eventually I made it up to the high road out of town. The first section of highway wasn’t as steep as I expected, but it ran through lesser mountain ranges that were anything but small. I started to suffer pretty badly. In San Miguel I had thought seriously about getting rid of some of my equipment—it’s too much weight on the bike. I hadn’t camped once yet on the Mexico trip, and losing that gear would be a blessing. It would also involve the dubious process of trying to mail it somewhere, an endeavor that all my friends, local and ex-pat alike, warn me is a gamble. Packages have a habit of disappearing in the Mexican post office, particularly things that look valuable. Ultimately I kept the gear, more for the assurance of being able to camp than out of fear of mail sorters. I had been lucky finding hotels so far, but some nights had been close calls and I liked the security of being able to sleep anywhere. But that extra weight really added up in the mountains out of San Miguel. I could feel the strain in my knees now, and with my lingering chest cold sometimes had coughing fits on the uphills. It was a rough day. So when I finally reached San Juan del Río, my destination for the night, I was more than ready to quit. The town is build along a river. That means that entering town is a downhill, but going across town is uphill again–going down one river bank and up the other. I didn’t even try to bike in; as soon as I got off the highway I spotted a corporate looking hotel and got a room. It was a bit pricier than I was used to, but nice. After a shower it was almost sunset. I was hungry, and I generally avoid hotel restaurants. I saddled up the Giant once again, this time without all his heavy gear on him, and rode into town. The way couldn’t have been flatter. After crossing an old stone bridge I was on a main road toward the Centro. 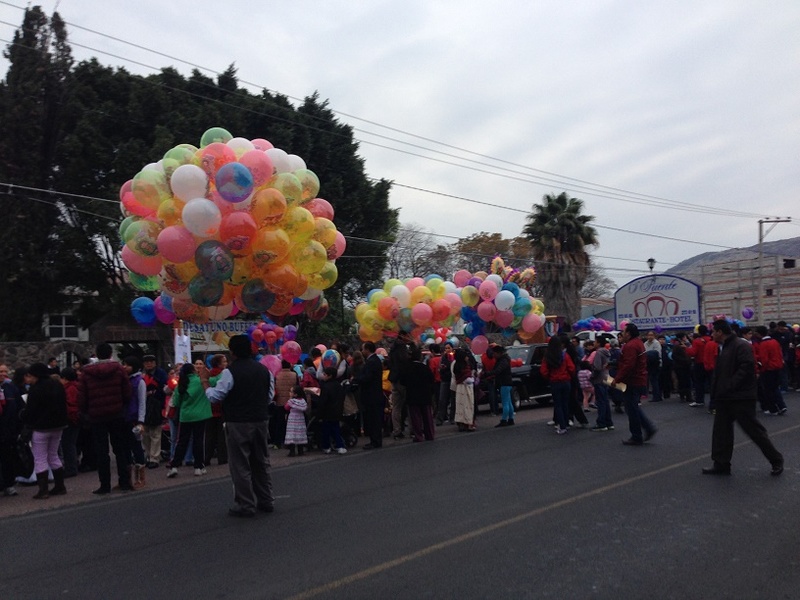 I quickly ran into a variety of roadblocks: backed up traffic, a traffic cop turning away cars, and then balloons, crowds of children and families. It was December 11, the eve of the Feast Day of the Virgin of Guadalupe, Mexico’s patron saint. I knew this holiday would be a big deal but didn’t realize there’d be a parade the night before. I biked floats and bands getting ready for the march, as far as the Parroquia (parish church), the parade’s destination. I spotted two eateries along the route, one directly across from the other, and decided to check them out. The first one had a convenient wrought iron fence around the patio tables, the perfect place to lock my bike. But inside it turned out to be more a bar than a restaurant. A too-friendly drunk greeted me warmly and went for an abrazo that I deftly dodged. Stumbling between English and Spanish, he told me he was buying me a drink. I exchanged looks with the bartender and said I needed to eat before I could drink. I didn’t exactly promise to come back after, but the drunkard took it that way and stopped protesting. I checked out. Across the street was a taquería that smelled divine. They didn’t have a bar, thankfully, but they had a giant grill and a big selection of alambres. I sat down and ordered some ludicrous combination of grilled meats and veggies. My table was positioned at the open end of the restaurant, directly facing the parade route (and my bike). Scene from the parade prep. Photo by André. Mexican parades come in many shapes and flavors, but they have some common elements. There’s always people chasing other people with bull-whips, and cracking the whips loudly on the ground. There’s a contingent of dancers in full Aztec regalia (or other indigenous style). There are religious floats put together from colored paper in careful and incredible detail. And there people in what seem like totally random costumes: a devil, a Bart Simpson, a Batman. The parade ended not long after dark. I retrieved my bike without running into my drunk friend and crossed the bridge back to the hotel—a bit hairier of a run in the dark with post-parade traffic. The hotel offered wi-fi only in the lobby, not in the rooms, so I took a seat on a couch to work on my computer and ordered a chocolate malt. It’s good for the concentration. 63.7 miles. Note: The route leaving San Miguel de Allende isn’t quite right due to one-ways. I knocked 0.1 miles off the listed mileage to compensate. Tula’s centro. Photo by André. Morning came all too soon. I ordered breakfast from the hotel room service, wanting to get on the road with minimal delay. What arrived was a heaping dish of soggy, lukewarm chilaquiles. I’d feel vaguely queasy for much of the day. The route was difficult. I headed back toward the same stone bridge as before but, instead of crossing it, turned onto a cross street toward the highway out of town. That highway was nothing but miles and miles of endless uphill, so steep I kept stopping just to breathe. Add in a headwind and sections of freeway with no shoulder and it was an inauspicious start to the day. It was also slow going. It took about two hours just to get out of the San Juan metro area, simply from the conditions. Once free the scenery got better but the road didn’t change much. The next 35 miles of my ride were all uphill, crossing a mountain range and ascending to a height of 9,000 feet. That’s nine thousand. To be fair, I wasn’t starting out from a height of zero. More like 5,000 feet. But climbing to 9k is still a ton and this was the highest elevation I’d ever achieved by bike. To put it in perspective, I announced I was starting this 35 mile section on Twitter at 11:15 am and tweeted from the top at 4:24 pm. That’s an average of seven grueling miles per hour with, as I recall, no real breaks. I was wrong about the 24 miles. Covered with sweat and hardly able to breathe, I raised my hand and gave the sign a one-finger salute. I couldn’t get a picture of this, obviously, but I sure hope a few Mexicans in passing cars saw the gesture and got a good laugh. Soon the wind was rushing past my face and I needed both hands on the steed. A plummeting bicycle is an amazing piece of equipment. A twitch of the hips is enough to change direction; at speed you’re just the fin on the missile. Those downhill miles went by quickly but, alas, it wouldn’t be all bullet time. To reach Tula de Allende I needed to turn off onto a cuota, a toll road. That road ran through a series of miniature mountains, effectively the foothills of the range I’d just crossed, and my progress ground to a crawl once again. By this time the sun was setting and I felt pretty done for the day, with miles still to go. I crossed a series of three yawning gorges, each seemingly a mile deep below me. My eyes flickered between the road ahead, the traffic behind me and the view under my feet. Between gorges and curves I saw the lights of Tula in the distance. Or so I thought. It was actually the city’s massive oil refinery: a glittering forest of tower lights reminiscent of the Emerald City. At dusk I reached the toll road turn-off. It looked totally deserted. I made my assault on the gate, hoping to swerve right around it, but a uniformed man ran out and waved his arms. Weary, I braked. “Buenas tardes,” I called. I figured he was going to hassle me about biking on the cuota, or tell me I couldn’t go through. But he was in a good mood—in fact he seemed excited to see a cyclist. He warmly offered for me to swerve around the gate (as I was going to do anyway). I appreciated his attitude, but was so tired I kind of wished he just stayed in the booth—I gave up all my speed to talk to him. Entering town involved an incredibly steep descent into a gorge. I thought I was going to pitch right over my handlebars. At the bottom I crossed two bridges and rolled into the Centro. 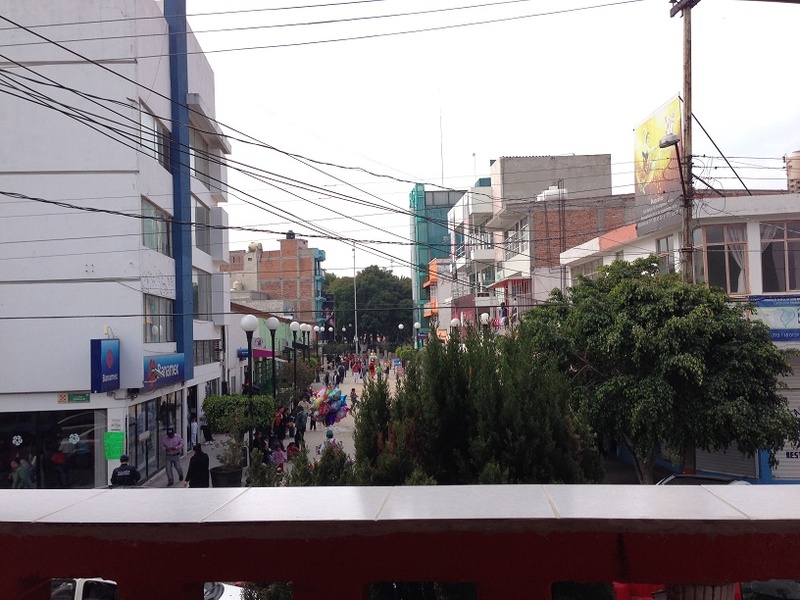 I don’t know what I was expecting, but Tula immediately felt different from other Mexican towns. At the moment I was too beat to figure out why. I aimed for one of the hotels I saw on Google, the Hotel Cuellar. It was right across from the parroquia in the heart of the Centro. It was already dark when I rolled into its long, narrow entrance. Though weary I had to go through the formalities. This includes finding out the price, looking at the room, checking for bed bugs and making sure there’s wi-fi. In this case, the process stopped at the price. “How much is a habitation for one person?” I asked. That’s about US $50, more than I usually pay ($350 is a common rate). I didn’t really want to go somewhere else—but I also had a budget. And I knew there were three more hotels within a few blocks. Deal. I thanked him, checked the room and quickly concluded our transaction. He asked me about my travels. To my surprise, I found I could follow the conversation and give good answers. The Spanish classes appeared to be working. Soon I was upstairs and showering, but without my bike. Usually I take the Giant into my hotel room with me, but here there were a lot of stairs. I chained up the bike outside—to a palm tree. Offer incense to Guadalupe. It was her day, after all. First to the church. The parroquia, a former monastery, occupied high ground in the middle of town and was surrounded with a fortified stone wall. I ascended through its portcullis expecting a giant Guadalupe shrine. 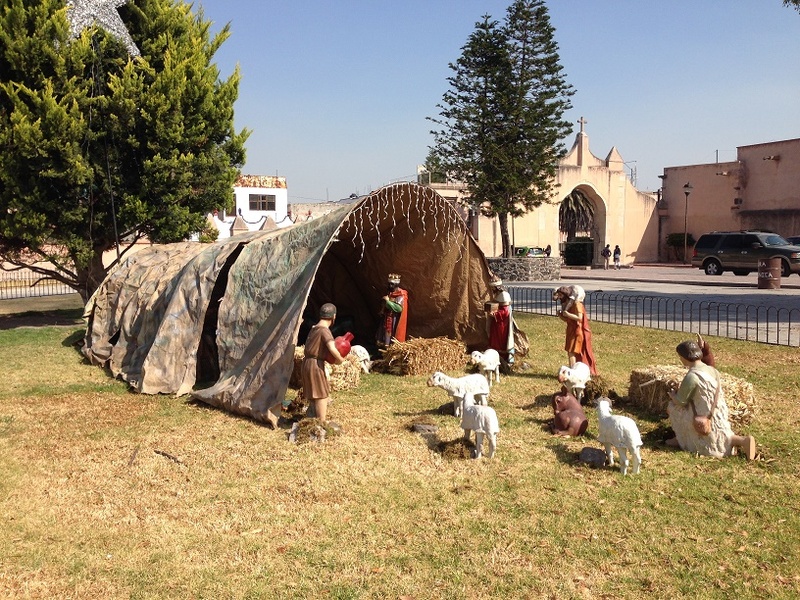 There wasn’t one; just a nativity scene, food vendors, and a jam packed church. I decided to keep exploring. …and was blown away. The restaurant had two parts: a cozy inside dining room with a bar, and a large outside courtyard with soft music playing. It was chilly so I chose the inside. And the menu offered much more than just grilled meats. Soon I had a huge platter in front of me. …and this time it was different. As the conversation went on I relaxed. I understood almost everything he said. Occasionally he threw out some words in English to help me, but we basically stuck to Spanish. For ten minutes. Fifteen. Twenty. It became the longest Spanish conversation I’d had with someone who wasn’t paid to help me. And I liked him. 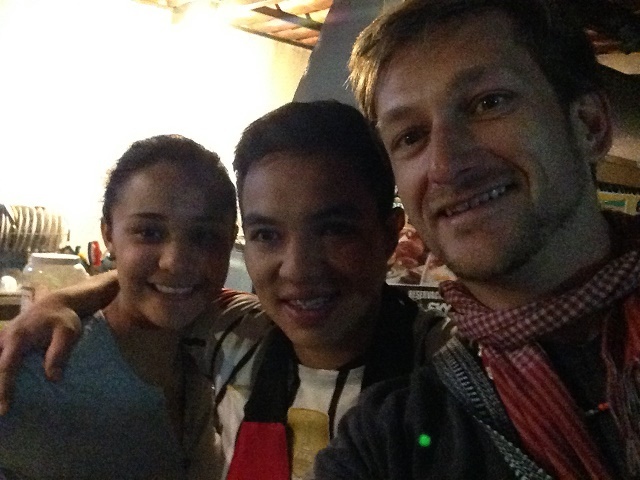 Ezra was from Brasil and running this restaurant was his dream. Previously he had been a chef at Fogo de Chão, a Brazilian chain famous enough that I knew of it (but had never eaten at one). He also introduced his wife, Kayla. She didn’t speak much Spanish so she would shyly murmur in Portuguese and he translated. All told we talked a half hour or more. He pointed at his heart. “The gods within?” he asked. He seemed to understand. After a bit more conversation, he mentioned that there was an old Aztec statue in his courtyard. I told him. He nodded, and went on. I agreed and the three of us walked into the courtyard. At the far end was a statue of a goddess I’d seen before. If my knowledge of Mexican mythology is accurate, she’s the exact one that Guadalupe is believed to be based on. I couldn’t help but smile. I took out the incense. In my heart, Guadalupe told me to offer only one stick, not two as I’d planned; save the other one for the pyramid. I lit the incense and placed it in the earth before the goddess, praying over it. Ezra and Kayla had a movie projector set up in the courtyard. It was past closing time and they were getting ready for a movie night together. We said farewell and I promised I would come back during my next few days in Tula. I wandered a bit more then made my way back to the Cuellar for some sleep. 59.6 miles. Next time you’ll get to see Tula’s famous pyramids—and we’ll fine out why this town feels so different. Until then, more road logs are available here.